Even before Tell City was officially settled by members of the Swiss Colonization Society, August Pfaefflin, the society’s chief surveyor, laid out the city’s streets so they were 70 to 80 feet wide and running due north/south and east/west. These uncommonly wide avenues, designed in their grid pattern, were planned according to the founding fathers, “with the future in mind.” In other words, Tell City’s street system has always been, and will always be, one of its most valuable assets. The Tell City Street Department, under the direction of Street Commissioner Jeff Everly, has the awesome responsibility of managing the community’s 45.7 miles of streets, as well as its alleys. This includes all maintenance/repair programs, paving projects, street cleaning, snow removal, and street signage. In addition to all of this, the Street Commissioner also manages Tell City’s trash removal and recycling program. And, because burning trash is banned in this community, it has grown into a massive program, resulting in the pick-up and disposal of more than 1,800 tons of trash, and more than 400 tons of recyclable materials every year. Each spring, the Street Department holds its Annual Spring Clean-up and, in one week, collects more than 130 tons of household trash not typically allowed during the rest of the year. Another vital responsibility for the Street Department is maintaining the Tell City floodwall and levee in accordance with strict federal regulations, including the community’s network of pumping stations. Maintenance of Windy Creek is a part of this program. 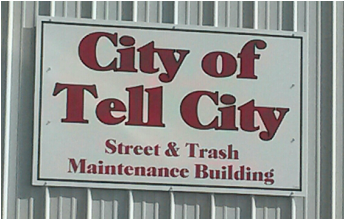 Finally, the Street Department is in charge of the maintenance of Tell City’s various properties. This entails mowing crews, chipping and disposal of fallen trees and tree limbs, and even the removal of yard and garden materials collected by individuals throughout the community. Spring Clean-up Date to Be Announced.